Common Frog. Image by Laurie Campbell. In the UK we have just 6 native species of amphibian, half of these are newts and we also have two species of toad and one species of frog. There are also introduced species but these will not be covered in this article. Our three newt species are the Palmate newt (Triturus helveticus), the Smooth or Common Newt (Triturus vulgaris) and the Great Crested Newt (Triturus cristatus). This year’s young newts are not (generally) quite ready to leave the water as yet, generally beginning to venture out from next month onwards. However, the young of our frog and toad species are a little more advanced and are beginning to leave their ponds in search of food – whilst of course trying not to become food themselves! If you have seen spawn earlier in the year then now is a great time to head down on an evening with a torch and keep an eye on the pond borders for signs of these marauding miniature amphibians. Their sole purpose at this stage in their lives is to find food whilst trying to stay off the menu themselves! As you would expect, we are not alone in our knowledge of this mass exodus and it is also a great idea to plan for a longer stay, get yourself comfortable and take a red ‘mask’ of filter to put over your torch. If you can manage to sit downwind of the pond and keep still and quiet then you may also see some of the predators on their nightly rounds looking for an easy meal. These will include badgers, foxes, hedgehogs, rats and even tawny owls. Whilst perhaps a little macabre it is a great opportunity to see these often elusive animals. As a further bonus you may also see one or more of the newt species mentioned above; whilst the young newts are not quite ready to leave the water the adults are likely to be out and about on the look out for a tasty slug or worm. The remainder of the article will have a quick look through our native frog and toad species. 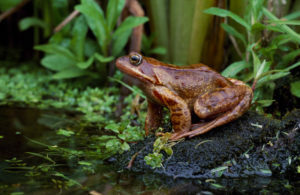 Common frogs are found in most of the UK and can be seen from March to October after hibernating during the winter months. Their appearance, as shown in the two images below, can be quite varied with colours ranging from yellowy brown to an almost reddish tone. Common Frogs are generally around 6 to 9 cm with males usually smaller than the females. Spawning usually occurs in early March though can be as early as January and can continue into summer. Spawn is laid in large clumps of several hundred eggs and is a well known sight, though it is estimated that only a few per thousand will survive till adulthood. Tadpoles hatch after 2 to 3 weeks, at which point they are black in colour and breathe via gills, taking in oxygen from the surrounding water. After a short time they begin to turn to a brown colour with a speckled appearance and can then be distinguished from the tadpoles of the common toad which are always black. During the next 10 weeks the tadpoles rapidly develop and grow front and back legs, loose their tales and develop lungs. These tiny froglets are now ready to leave the water and alter their diets from plant matter to slugs, worms, snails and insects. Frogs lead a perilous life, even before they hatch as tadpoles. In the water, the tadpoles are vulnerable to birds, fish, beetles and dragonfly larvae, out of the water the perils are still great as they are preyed upon by a variety of birds such as herons, terns, owls and crows, and are also a favourite of stoats, weasels, badgers, otters and pine martins. Should the young froglets survive, they will become fully grown adults in around three years, and can live up to eight years. Common Toad. Image by Laurie Campbell. Common Toads are distinguished from Common Frogs by their warty skin and the fact that they generally walk rather than hop or jump. They are also larger than Common Frogs with males being around 8cm and the females substantially larger at 13cm. Common Toads emerge from hibernation around the same time as Common Frogs and make the all to often fatal journey to the same pond. Sadly, many are killed crossing main roads; many ‘Toad Crossing’ signs have been put up to try to reduce this, along with provision of tunnels under busy roads. During mating the male toads clasp onto the backs (known as an ‘Amplexus’ hold)of the females and stay in this position for several days until the spawn has been layered. Toad spawn is easily distinguished from frog spawn as it is laid in strings as opposed to clumps. The eggs hatch within 10 days, but despite being distasteful to predators, few will reach adulthood. The period of growth is similar to that of Common Frogs and the young Toadlets will be ready to leave the pond around 10 weeks after hatching, though at that stage may only be around the size of a finger nail. Common Toads are subject to the same predators as are Common Frogs though they do have a couple of defence mechanisms. Firstly, when threatened they can inflate their lungs with air and stretch out their legs to make them appear much larger, and secondly they also secrete an irritant substance onto their skin which can help put off predators. Should they survive they will reach full adulthood in 4 years. Common Toads also have a similar diet to Common Frogs, though being bigger they can also prey on slow worms, small grass snakes and even harvest mice! They also have a much longer lifespan than Common Frogs and can live for up to 40 years. 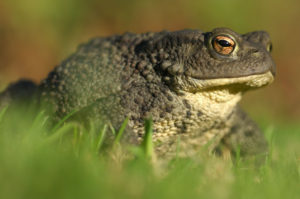 Our second species of toad is our rarest by far and is an endangered species protect under the Wildlife and Countryside Act 1981. Natterjacks can usually be distinguished from Common Toads by their grey/green skin with a yellow stripe down its back. They also have shorter legs than Common Toads and tend to run rather than walk. They are of a similar size to Common Frogs at around 7 or 8 cm (again, females are bigger). Natterjacks tend to come out of hibernation a little later than Common Frogs and Toads but also get straight into breeding. They lay a string of eggs very similar to that of the Common Toad but with only a single row of eggs, as opposed to the double row laid by Common Toads. They also tend to use warm shallow and unshaded pools which may dry out during summer, this helps prevent predation by fish, dragonfly and beetle larvae as they cannot become established, and also reduces competition from other species. Males have an extremely loud mating call to attract females and can be heard up to 2Km away. 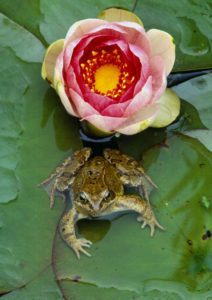 Due to their unique choice of nursery and the warmer water, development is much quicker and the toadlets may be ready to leave the water in as little as 6 to 8 weeks, meaning that whilst been born much later, they leave their ponds at around the same time as both Common Toads and Frogs. Natterjacks eat a similar diet to our other amphibians, including beetles, slugs, snails, worms and spiders. Young toadlets grow very quickly in their first year and maybe up to 30mm long by the time they hibernate for the first time. They will reach their full adult size within 4 years. Natterjack Toads are subject to the same predation as our other two species and share the ‘bloated’ defence mechanisms used by Common Toads. As previously mentioned Natterjacks are an endangered species and as a result can only be seen in select areas within the UK. These include East Anglia, coastal areas in North West England and in parts of Scotland such as the Solway Firth and in particular the Caerlaverock National Nature Reserve.